Won’t it be amazing if you get all the details about a person just by using the email address?? Well, that’s exactly what lead enrichment tools do! We’ve listed some powerful tools with the help of which you can find complete information of the leads such as – social media accounts, professional profiles, company name, location, everything about that person by using their email address. Following is the comparison table of the tools used for lead enrichment. Quickly, have a glance at them for better understanding & differentiation. And for more details, scroll down! With these lead enrichment tools, you can effortlessly search for the details of any person & get all the details like age, social accounts, full name, etc on your fingertips. All you have to do is, simply insert the email id of the person & there you go! Such data will help to make the conversation more interesting & chances of converting that person will become So High. 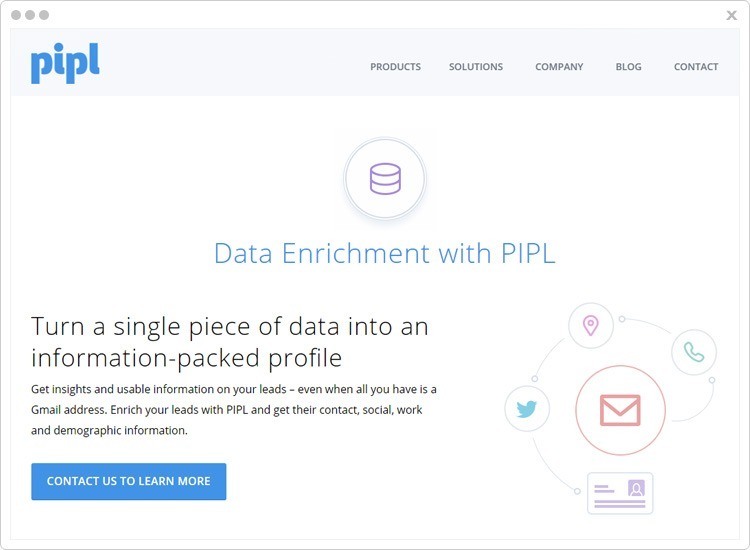 FullContact provides data API for lead enrichment. This API gives a 360º view of the person. So, you get a complete vision of the person from various data point by using their email, phone number or name. 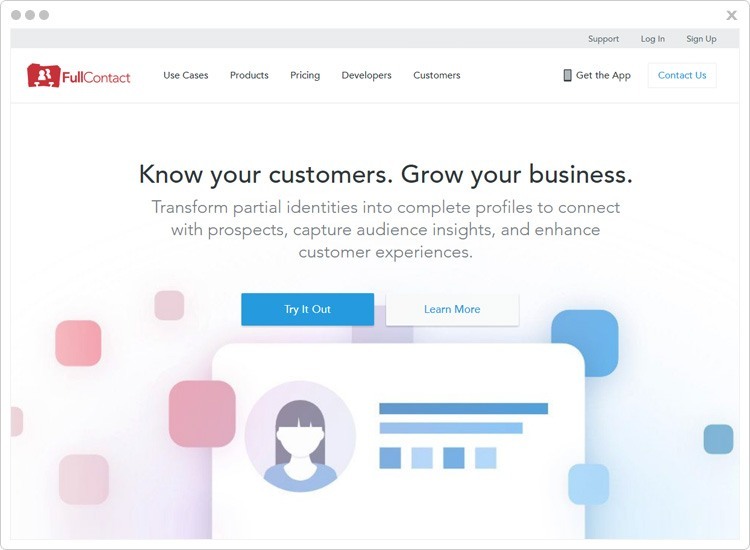 FullContact offers pre-built integration to the customer such as Slack, Xplenty, Conspire, automate.io, Zendesk, Retainly, and many others are coming soon. The software extract information from the social web which is returned in the form of HTML, XML, or JSON languages. Basic– It is a free plan. Premium– It will cost you $9.99 per month for a single user. Team– This will cost you $12.99 /Month for a user. Small Business– It will cost you $9.99 per month for a single user. Enterprise– This is a custom plan, so get in touch with the sales team. To avail of this plan, contact the sales team. 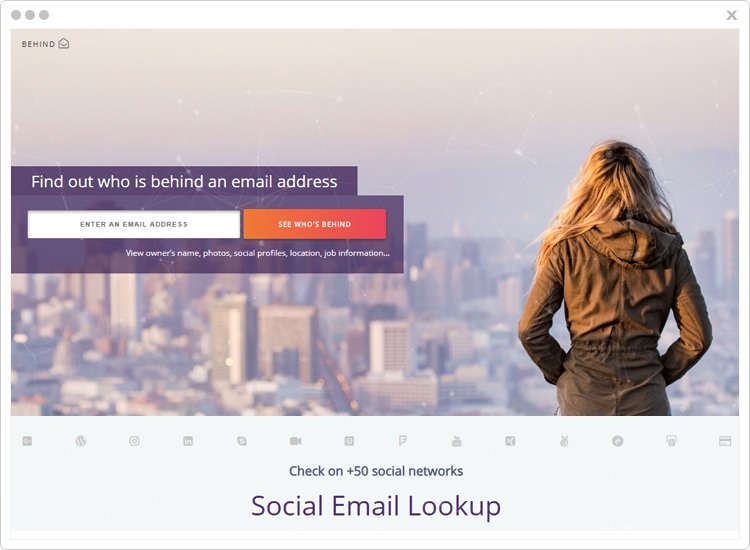 Pipl is the most powerful data enrichment software that turns any email address or domain into the complete person’s profile. The software gives you rich customer insight including name, company size, job information, demographics, social profiles and a lot more. By using data enrichment tools, you can find data in bulk by just uploading the file of email addresses and the software will fetch the complete information of the leads at once. In addition, the software also merges person profiles & duplicate data, normalize person contact information, verified online & offline information of the person. Pipl generates a comprehensive report on a person in a few seconds that gives a clear picture of your lead so that you can understand the lead in a much better way. Pipl’s starter plan will charge you $99 where you can search 200 matches in a month. The second plan allows to find 500 matches, for this, it will charge you $199 per month. Pipl’s third plan costs you $299/mo for unlimited matches. 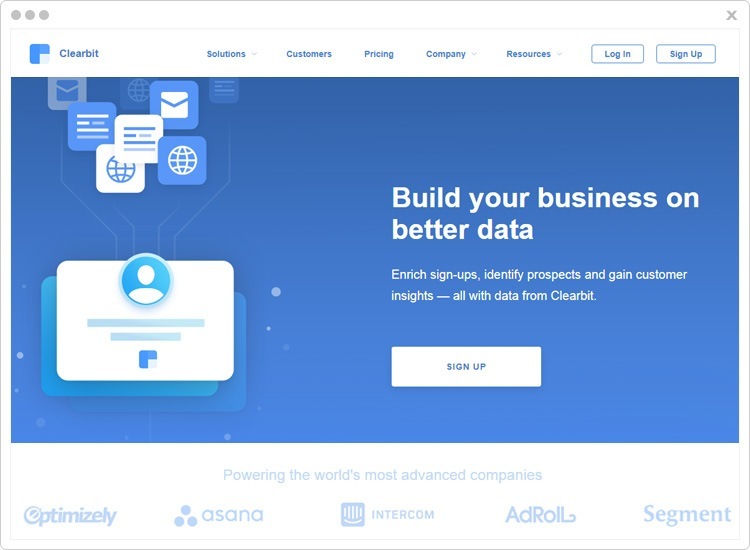 Clearbit is a lead enhancement tool through which you can extract lead information from social media sites like Facebook, Twitter, Linkedin, Google+, Pinterest etc within a minute. The data provided by this software appears in Salesforce automatically. Hence, it prevents you from spending hours on research and data entry. When you send an email address to the Clearbit, it instantly gives information related to that email address including location, job title, company size and even what technology products they are using. All the information which is provided by Clearbit system is accurate and verified that will help you to understand the lead effortlessly. The lead enhancement software can be integrated with Slack, Marketo, Salesforce, Segment, Zapior. And, you can also connect your existing services by using Clearbit API. The Plan A will cost you $99 per month where the user able to search data of 2500 person. Under the Plan B, the user can find data from 5000 people by just paying $149 per month. In this plan, you would be charged $199/mo for 10,000 matches. If you are using Salesforce and Marketo then you have to pay $499 per month where you can enrich data of unlimited leads. 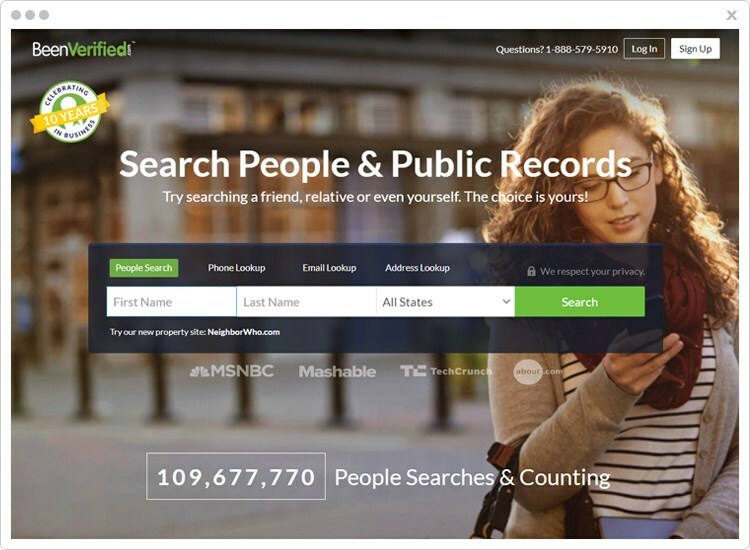 BeenVerified is an advanced social search engine with which you can find professional details, social media accounts, and lot more information about a person simply by using their email address. To find out the details, you need an email address, phone number, name or residential area of the person. When you enter the details & hit the search button, the tool extracts complete person’s information from the social web. Plus, you can also get to know background details of the person such as criminal records, arrest records, educational information and much more. The software delivers information including a person’s name, age, location, personal details, relative’s, property records, social media profiles, professional information, etc. BeenVerified data enrichment tool provides 1-month membership of $26.89. Here, the user will get a person’s name, address, age, location, phone number, photos, social media account and much more. While it will charge you $17.48 for a 3-month membership. In this plan, you can find people name, address, age, location, phone number, photos, social media account and more. One of the most popular social profile search engine is – Behind. It gives a clear picture of the person by using their email address. When you enter the email address of the person then they transform that information into complete person profiles. The behind social search engine search person’s name, photos, job information, location, and social profiles through their email address. The software extracts a person’s personal and professional information available on the social web from over 50+ social networking sites. With the help of this profile search engine, you can search data in bulk. It has the capability to access 2000,000 profiles at a time. For pricing details, you need to contact with Behind sales team. 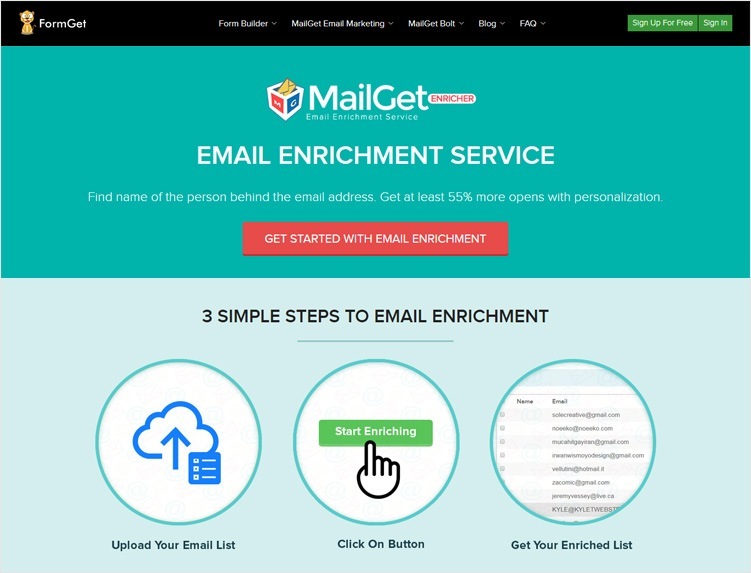 MailGet Enricher is a popular lead enrichment software which allows you to find person’s professional and social media accounts through the email address. So, it gives a rich insight into your leads within a few minutes. You can now enrich the leads & get information without any hassle. Simply upload the list of emails you want to enrich. Rest is done by the software itself. After enriching the emails in the list, it provides you with the data in a CSV file. The MailGet Enricher is trusted by reputed companies such as Cisco, Avaya, The Guardian, ISKCON and many others. The software fetches data from all social networking site like Facebook, Pinterest, Linkedin, Twitter etc and gives accurate results. It provides you with the status of the email id. If there is some error or email id is not working then it shows 404, else the status is 200. With the help of this software, you will get all the information related to the leads. So, you can send personalized email accordingly which definitely increases your open rates. $19/mo for 1000 lead information. $99/mo for 5000 lead information. $175/mo for 10,000 lead information. $225/mo for 15,000 lead information. $749/mo for 50,000 lead information. $999/mo for 1,00,000 lead information. $2999/mo for 3,00,000 lead information. $4999/mo for 5,00,000 lead information. $9999/mo for 1,000,000 lead information. Above mentioned 5 best email enrichment tools will surely help you to fetch someone’s social media account, professional details via email addresses. With the help of these tools, you can save your lot of time and energy too. For further queries, get in touch with us!